1) Decrease perceived exertion as well as fatigue in the triceps. 2) Allow the trainee to focus more on proper trunk/ hip posture now that triceps fatigue is decreased. 3) Express more power during the concentric phase of the repetition secondary to a reinforced base of support. 4) Improve plyometirc/ explosive push up performance by allowing a more stable base of support through the wrist, hand and forearm. I believe the ideal hand set up for a push up is something I refer to as a cambered hand position. I initially was exposed to this concept while reading a post on Jim Bathurst's site , highlighting his training session at a circus school here in Philadelphia. Jim mentioned that curling his hands while transitioning from a two arm to a one arm handstand. The rationale from his instructor was to allow improved hand strength, ultimately preparing the acrobat to perform a handstand on another person. Curious, I played with this position in my own pursuit of a reasonably lengthy handstand, and found the position to be extremely supportive, almost instantly improving the quality of my handstand, as well as decreasing upper quarter with my handstand support on the wall as well. What I initially noticed was an increase in activation of the forearm musculature, both in the flexors and extensors. Secondly, I noted decreased fatigue in the triceps and anterior shoulders, which became more apparent as my sets progressed. I then attempted a few sets of push ups after my handstand training, where I was even more pleasantly surprised. Almost all triceps fatigue that I normally experienced (which was my limiting factor in performance) decreased by greater than 50% qualitatively. The majority of the stress was now felt in the posterior aspect of the shoulder, particularly the posterior deltoid. This also allowed me to concentrate more on keeping my hips and abdominals engaged, as my focus wasn't on triceps fatigue. Once I made this "discovery", I started to utilize it with my patients, training clients and athletes. Without cuing them on where they felt fatigue primarily, the large majority noted substantially decreased fatigue/ discomfort in the triceps, as well as more engagement in the posterior shoulder. Almost all preferred the cambered hand position over the traditional hand position once they became proficient in it (which took place within 1-2 sessions). Set Up for the "Cambered Hand"
1) Place both hands together in opposition. 2) Bring fingers and thumb together, so they are touching. 3) Keeping palms and thumb touching, now pull your fingers away from each other. 6) Set up for your favorite push up variation and perform. Over the course of your next 2-4 training sessions, you should feel more comfortable as well as proficient in both hand positioning/ set-up as well as push up performance using the cambered hand position. As you can see, the fingers (actually the proximal and distal phalanges) are not making contact in the cambered hand position. You may also notice that the finger tips are closer together (as is the thumb tip) in the cambered hand position. Additionally, look at the thenar and hypothenar eminence imprint on the cambered hand-definitely more aggressive and engaged. The cambered hand to me looks actually more like an animal paw print rather than a human hand print. The hand intrinsics, finger flexors and extensors, as well as the forearm flexors and extensors all activate to the extent they are able to, stiffening the hand dynamically. As the agonist and anatgonistic hand musculature is activated, Sir Charles Sherrington's concepts of irradiation and successive induction take over, allowing spread of excitation, activation and contractility to the forearm musculature. In a traditional push up, little attention is usually paid to the setting of the hands; as a result there is no real "overflow" to the forearm musculature. The wrist extensors and flexors (and possibly the forearm pronators/ supinators) undergo increased active and passive tension, thereby stiffening the radioulnar joint by way of the interosseus membrane. This sets up a "rebar in concrete" like structure (the "rebar" being the radius, ulna and interosseus membrane, while the "concrete" being the active and passive muscle/ fascia interface). 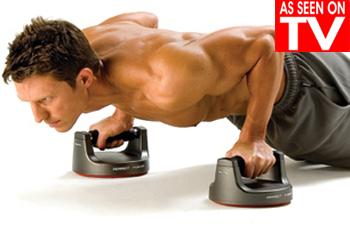 With the forearm strutted along with the hand, you now have a very stable base for the prime movers in the push up. As the forces from the ground meet the newly stiffened wrist, hand and forearm complex, one of the first things you will notice is a decrease in triceps fatigue as you move toward your individual higher repetition ranges. This also allows you to direct attention in maintaining proper stiffness in the trunk, which is a point of contention in many people, especially deep into a set.In most trainees, cambering the hand leads to increased quality repetitions per set, both with loaded and unloaded push ups. At this point, anyone who I have trained in the cambered hand position continues to prefer and perform them in this manner, from kids as young as eleven, to people in their fifties. The cambered hand position is a functional position for distal arm stability that allows improved performance metrics in most push up variations. By increasing the static and dynamic stability of your base, power is more easily transferred through the distal upper quarter through a combination of neurophysiology and biomechanics. At the end of the day, this is what we are all after-making an exercise that is already great even better. By the way, the answer to the question at the start of the article is pull ups; chin ups also count as a correct response. If you somehow got this wrong, drop and give me fifty push ups-with a cambered hand of course.